"Follow The Rainbow" - George Duke (voc, keyb); Larry Williams (ts, fl); Eric Culver (tb); Charles Icarus Johnson (g); Byron Miller (b); Ricky Lawson, Leon 'Ndugu' Chandler (dr); Sheila Escovedo (perc, voc); Napoleon Murphy Brock (voc), a.o. ﻿The fusion movement has a lot in common with a tropical storm: it rages fiercely in its early phases but becomes less wild later on, yet still blows a gale. 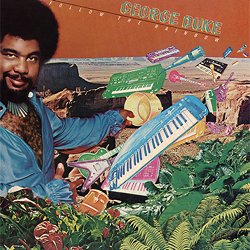 In the eye of the storm that tore its path through the various musical styles and genres as from 1960 is George Duke, who entered into creative and stormy partnerships with such artists as Frank Zappa, Miles Davis and Jean-Luc Ponty. The rainbow colours with which Duke chose to tint this album are taken less from the paintpots of fusion jazz and rock, and rather more from the black, natural colours of rhythm and blues. Next to a relaxed love groove ("Say That You Will") we find a polyphonic vocal number with solos ("Sunrise"), which conjures up the nostalgic atmosphere of Motown, now on the decline. Then there is snappy funk in all manner of variations, such as "Party Down", which swings trendily along but then comes over unfiltered and dry as a bone. In "Follow The Rainbow", genial musicianship, expert arrangements and a special feeling for resonance amalgamate to create a tightly-knit sound which is ever fresh and easy-going. This Speakers Corner LP was remastered using pure analogue components only, from the master tapes through to the cutting head. More information under http://www.pure-analogue.com. All royalties and mechanical rights have been paid.